I saw this week’s film when it came out under circumstances I’m not proud of. I was in seminary and, working with a friend, was cleaning out the dorms at the end of the school year. We found a box (in a dumpster, don't ask), a little treasure chest, full of change -- nearly $30.00 worth. We asked around to see if anyone knew where it came from, but we didn’t ask very many people. You’d think, as good students of theology and ethics, we would have gone to great efforts to find the rightful owners of the cash, but no. We only went to moderate effort. We could have used that money for a good cause: foreign missions, projects to feed the hungry, providing fresh water to the thirsty. That money could have gone to a scholarship to send kids to camp. We spent the money on pizza and going to a drive-in movie. Weeks later we heard from someone who thought the money was his. The father, Steve, is out of work (“I’m into downward mobility”) and in financial straits after their home’s destruction in the first film. (Since this post is already plagued with tangents, I’ll add another. Steve was played by Craig T. Nelson, who I met at church in Hawaii while Mindy and I were traveling the country in 2016.) The family is living in the home of Diane’s mother, Gramma-Jess (Geraldine Fitzgerald). But wouldn’t you know it, just as ghosts besieged the Freeling family in the first film, it’s happening again in this one. In the first film, the problem was building the their home over a Native American burial ground (as we discussed last week, location is so important in real estate.) This film has ghosts that, in life, were followers of a strange 18th century preacher. Nope, nothing creepy about that at all. Carol Anne won’t go with him, so he tells her he’ll sing her a song, which goes, “God is in His holy temple, earthly thoughts be silent now.” Diane finds them both and thanks the preacher for caring for her daughter. After the family leaves, we see someone walk right through the old man. Then more tragedy strikes the Freeling family. Gramma-Jess dies in her sleep, but Carol Ann gets a post-mortem phone call from her grandmother on her toy telephone. Then a Native American man, Taylor (Will Sampson), comes to the Freeling family and says he is there to protect them. They let him camp out in the backyard. The Freeling dog is not fond of the stranger; he seems afraid. “We’ve had enough of door to door salesmen,” Steve says. “How do you know?” Steve asks. The Reverend leaves and the rain stops. They need help, so they call on the psychic from the first film, Tangina Barrons (Zelda Rubinstein in her Razzie-winning role). She explains the history of the Reverend Kane to the Freeling family, “There was a religious sect that mysteriously disappeared. Their leader was a medium, he led his people in the early 1800’s to start a utopian society. They disappeared and were believed to be massacred by Indians.” Now this sect is trapped in the underworld, but they believe Carol Anne has a link to the beyond, and they want to possess her in order to escape. The remainder of the film is a battle between the Freeling family and the Beast, Rev. Kane, and the demon ghosts that worship him. The Freeling family trusts in Native American spirituality for their ultimate victory in opposition to Kane who takes the role of a Christian pastor, though he is nothing of the sort. He obviously has nothing to do with Jesus or God’s grace. Because of that, we are giving Kane and his church our lowest Movie Church rating of one steeple. 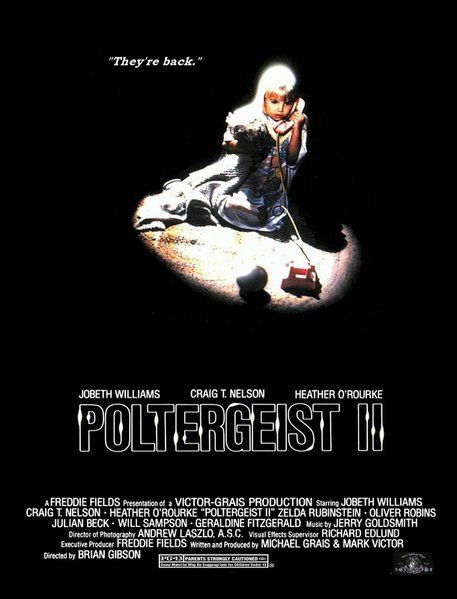 At Movie Churches, we believe in grace, which is why we tell you, “Skip Poltergeist II: The Other Side,” just as we plan to continue avoiding Poltergeist III. What you do with found money is between you and God.